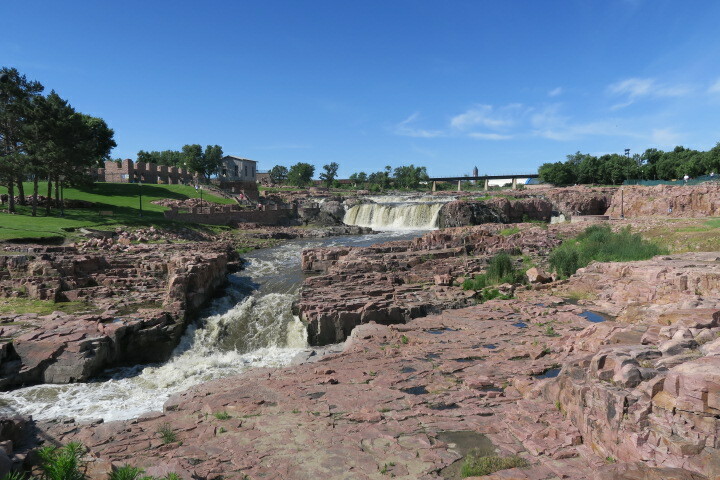 Eleven days ago we flew into Sioux Falls and our flight for home takes off today at 2:45 p.m. That gives us all morning to see something of the city. The highest-rated attraction, and the most logical thing for us to visit is– what else? 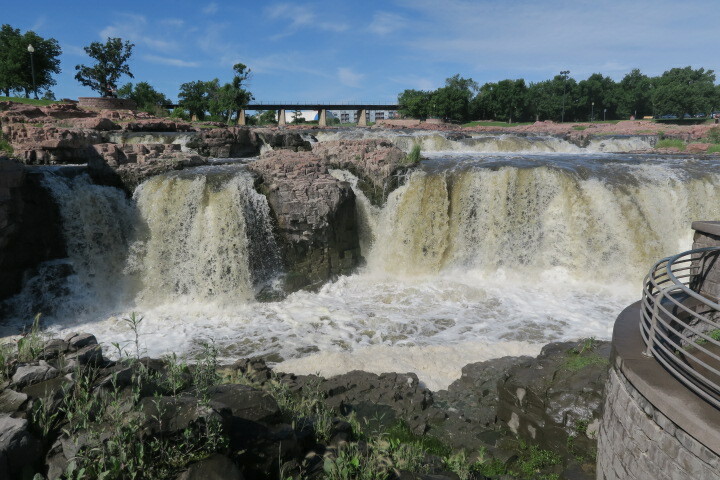 The Sioux Falls. We set the GPS for the downtown park. I’m expecting to find a small park with a small waterfall, something like Chagrin Falls near where we live in Ohio, or Idaho Falls, close to Doc’s hometown. 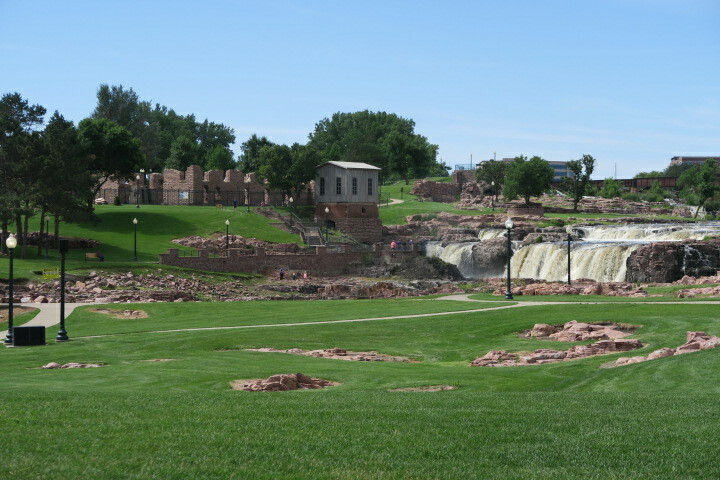 But the Sioux Falls Park is large, with a river running through it and a waterfall that has multiple drops. 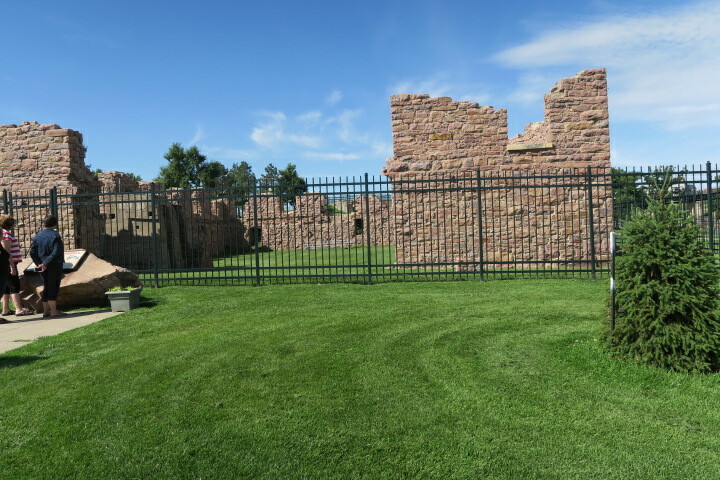 The park is beautifully maintained and has interesting geological features. Clusters of large pink rock, Sioux quartzite, lie all around the park. This particular rock is extremely hard and resists erosion. 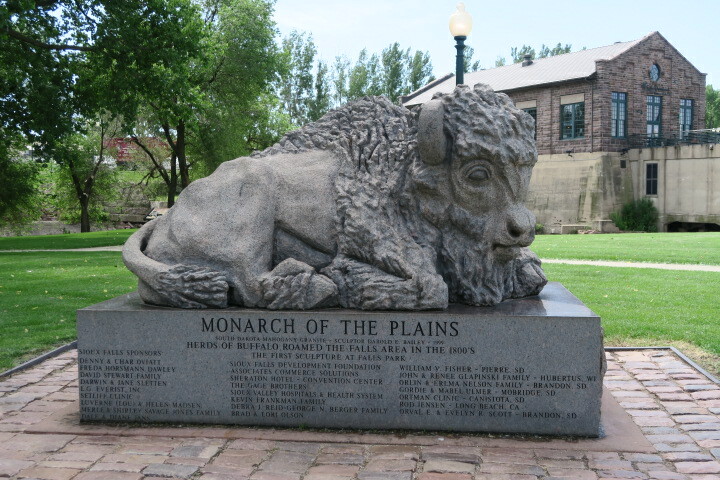 Many buildings in South Dakota have been built with it. Even the highways are pink. We follow a sidewalk around the base of the falls and cross a bridge to the opposite side of the river where the ruins of an old mill still stands. An old electric power plant is now a café. Informational boards are posted here and there along the sidewalks, giving us a good understanding of the area’s history. 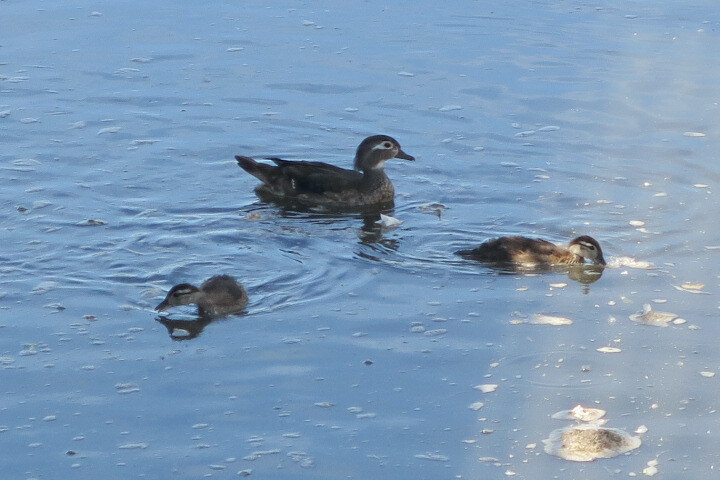 We stop to watch a family of ducks. Further downriver, we watch people fishing. 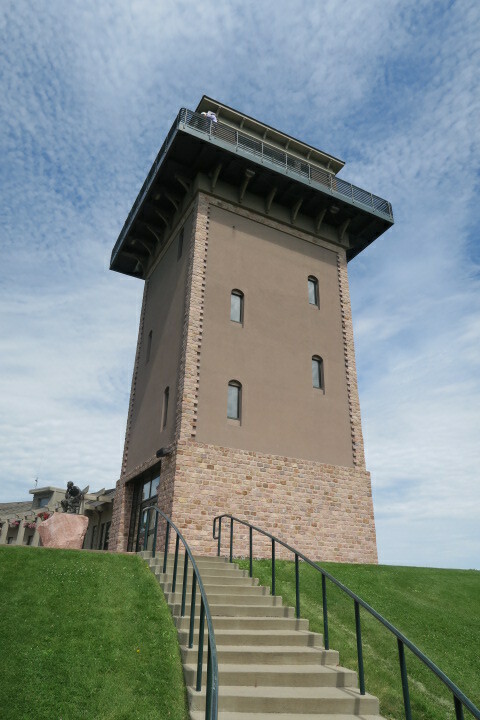 There is a viewing tower where we take an elevator to the top for a nice view of the falls and surrounding area. It is crowded with everyone trying to maneuver to a spot at the railing so that they can take their family photos with the falls in the background. 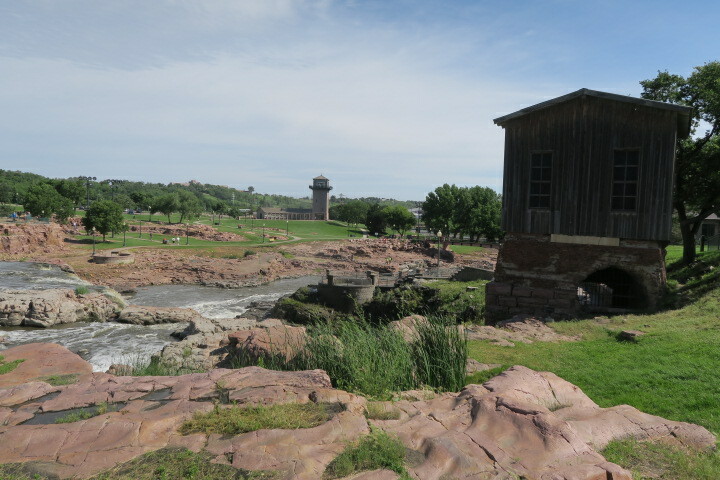 We spend a couple of hours walking around the park, reading the boards and looking at the falls from various viewpoints. It’s another beautiful day. At the airport, there is a long line at security, but a TSA worker comes along and asks if anyone has “TSA prescreening” marked on their boarding pass. He leads Doc and I to a second, empty line and we’re led through security in just a few moments. I love small airports. The airport Sioux Falls has just six gates. There is no chance of getting lost and we don’t have to walk for miles. It’s my favorite kind of flight day – it’s uneventful. We arrive in Cleveland a few minutes early and make our way to the car. Uh–Oh. We’ve forgotten about the car. The day we arrived at the airport, Doc pulled into a parking space, caught the bumper on a spike that was sticking up from a concrete barrier, and pulled the bumper off of the car. We had tried to snap it back into place. But will it hold until we can get home? I have some travel duct tape in the toiletry bag. Doc tapes the bumper to the car and we pull out of the parking lot, hoping for the best. We get out on the highway and almost immediately hear a scraping. We pull off to the side of the road. A large piece of black plastic is hanging from the underside of the car, dragging the road and rubbing the front right tire. We can’t find a way to tie it up so we try to tear it off. I dig around in the toiletry bag and find a pair of scissors. Doc manages to cut the plastic. I throw it into the back seat and we’re on our way. Almost immediately, we hear the same scraping sound again. We pull off to the side of the highway for the second time. An identical piece of plastic is hanging down, this time on the front left side of the car. Doc gets the scissors and is able to cut away another big chunk of car. This, I’m afraid, is going to be expensive. We’re home once again. Another grand adventure has come to an end. Tomorrow I’ll begin planning the next one. Post-vacation notes: As many times as we’ve been to Yellowstone, I’ve never come away feeling like I’ve done it justice. There are hiking trails everywhere and every time we complete one, I realize how many hidden areas of the park there are that we are totally unaware of. Yellowstone is a park, yes. But it’s a huge park that covers 3,500 square miles. It covers not only a large chunk of the state of Wyoming but also reaches into Montana and Idaho. And if you add the adjacent Grand Teton National Park to your agenda…well, that’s a whopping big area to cover. I think it’s probably time to think about doing a Yellowstone/Grand Teton vacation as a lone destination. Rent a cabin, move in, and stay for a week. Or two. And Pahaska Tepee is where I want to stay. While we had so much fun touring the park with our family, I can’t help but be disappointed that we didn’t have more time to just hang out at our cabin. Our cabin was beautiful as were the grounds. I would have loved to have taken one of Pahaska’s guided horseback trail rides or an early morning hike. It would have been fun to tour the historic lodge and maybe have an after-dinner drink in the tavern. If only time didn’t move so quickly!